We Live In A Political World: #218 / What Is Wrong With This Picture? #218 / What Is Wrong With This Picture? Above is Tess Thompson Talley of Kentucky. 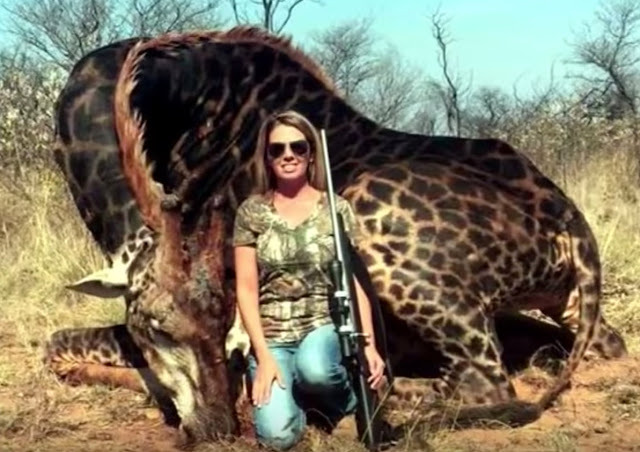 She is credited with killing the giraffe shown in the picture. Click the link to her name to see more pictures. An article in The New York Times discusses the circumstances. In my opinion, we should not really have to ask ourselves, "what is wrong with this picture?" Isn't it clear that life on Earth is at risk? Don't we understand that we are all threatened with extinction? Let's not hasten the day, alright? Let's try to protect every form of life, OK? That would be good for us, too, not just the giraffes!